Koyote had the most liked content! Below is my yellow and black color scheme test-model. I'm still not sold on the color scheme, but I'll likely forge ahead with it. I'll need to add more color to my Necro bases. Areas of danger stripes and puddles of toxic goo should do the trick. Last Tuesday was the last game of the Dark Tower mini-campaign. Overall, my Cawdor fared well. They went 4-1-0 plus one 'bye week' due to an odd number of players. The campaign was restricted to 6 pre-selected scenarios and CO arranged pairings. The number of participants was small, but we had a good mix of gangs (Cawdor, Orlock, Genestealer Cult, Escher, & Venators). Since all of the games were played on Zone Mortalis boards, I made good use of grenades, bomb delivery rats, and the Cawdor heavy crossbow to blast models hiding around corners. One Ganger (aptly named Demo) used his blasting charges to rack up 18 experience points in only 5 games (he "earned" 1 xp more for the bye week). Crazy. The only model that beat Demo in xps was my leader, Cutter John, and that's only because as a leader he was earning an extra 1 xp for every game that I won. Aside from the Ambush scenario, where I played the defender, my hardest fought game was Game 6. I fielded 11 models (1 leader, 3 champs, 1 sheen bird, & 6 gangers) in this final game. When the smoke cleared all of the Escher had fled (failed CL tests after a failed bottle test) or went OOA. All that was left of my gang was my leader, 3 champs, and 1 ganger (Demo) remained on the board. The other six models went OOA. Four went into Recovery and two of those suffered stat reductions. For me, the highlight of Game 6 was taking out the Escher leader with my Sheen Bird. The Escher had only one wound remaining when the birdie attacked, but she did have a 3+ save. Unfortunately for my opponent 2 of the Sheen Bird's attacks got through the leader's armor and since they are each damage 2 attacks, I got to roll 4 injury dice. Two came up skulls. To add insult to injury, the Escher leader's result on the lasting injury table was: Humiliated (-1 LD & CL). The Sheen Bird earned 2 xp for taking out the leader, 1 xp for rallying after failing a Nerve Test, and another 1 xp for participating in the scenario, for a total of 4 xp. Pretty damn good for a S3 T2 birdie. Sheen Bird stats are meh and its Bate rule make it a bit unpredictable, so I doubt that I'll ever repeat the success it had against the Escher. Nevertheless, taking down the Escher's leader has earned the birdie a model upgrade (I'm currently using a Puppets War resin raven). After a brief internetz searching I found the perfect models, PP's Cryx Carrion Thralls. Large crow or raven? Check. Exposed areas of bone? Check. Exposed mechanical components? Check. The similarities between the Carrion Thralls and the Sheen Bird's description and artwork makes me wonder if someone at GW lifted the concept from PP. GW's boxed games have given them the opportunity to make some really fun character minis that otherwise wouldn't have made it to store shelves. The Rogue Trader and Blackstone Fortress boxes are treasure troves of cool, quirky minis that I'd like to paint and play with. Problem is, I'm not interested in playing the boxed games or returning to the 40K fold. So how do I justify purchasing my favorite Blackstone and RT minis from eBay? Necromunda. Using the Venator rules, the minis will form the core of an Ordo Xenos “gang” comprised of an Inquisitor and his cadre of agents. The genius of the Venator rules is that each class of fighter (i.e. leaders, champion, and ganger) has four stat lines to choose from. This lets you start the gang formation process by picking the models that you want to use, and then selecting the stat line you feel best represents each model. For instance, I want to include one of the Blackstone Ratlings in my "gang", so for the Ratling I’ll select that stat line with the improved BS and decreased WS. The Ordor Xenos Inquisitor, Lucian Baptiste, was an important character in my 40K Mortifactors army. I’ve decided that prior to leading an Astartes strike force against Dark Eldar incursions, a much younger Inquisitor Baptiste spent years assigned to the Hive World Necromunda, tasked with rooting out and eliminating the Genestealer cult-clans who dwell among the criminals, mutants, and scum of the Underhive. I've selected Artel Miniatures' Inquisitor Gregor to serve as the younger Baptiste. And because I couldn't pass up such a bizzare model, Artel's Preacher Ignacius Fahrnsworth will serve as one of his Acolytes. Inquisitor Baptiste adheres to the philosophy that the Puritans of his Order label ‘radical’. As such, the Inquisitor's henchmen will include both ab-humans and aliens. In fact, two of his most loyal agents are a Kroot Mercenary that he inherited from his Inquisitor Lord, and a Ratling scout that the Inquisitor saved from the gallows. Some of his other agents will include a master poisoner, a lectro-maester tech-priest, bounty hunters, former gangers, and any other quirky models that strike my fancy. The PVC is a great idea. My reading of the Delete Dead or Retiring Fighters rules on P.93 is that if a fighter dies outright (i.e. you roll a 66 on the Lasting Injury table), you can recover his gear only if you have a fighter on the board at the end of the game. If the fighter suffers a Critical Injury AND you spend a Post-Battle action to take that injured fighter to the Doc AND that fighter subsequently dies at the Doc's, then you can recover the equipment, regardless of whether or not you had a model on the board at the end of the game. In this latter case the price you pay to recover the equipment is the Post-Battle action to get the fighter to the Doc. If, at the end of a game your leader and all of your champions are 'in recovery' or captured, then you cannot perform a Post-Battle action. No Post-Battle actions means no visit to the Doc and no chance to recover the equipment from a fighter with a Critical Injury. Oh, and it doesn't state 'if you take a fighter to the doc', it states 'if you take the fighter to the doc'. Fluger, check out what Blackfyre Productions is doing in this campaign. In this campaign each player controls 2 members of a Venator gang in a series of linked scenarios. It's a narrative campaign where a GM creates a story and controls the antagonists and the players play cooperatively against the GM's antagonists. This is something you could do with your son or your son and PourSpelur. This will give you the freedom to tailor the scenarios and antagonists to match his skill level. 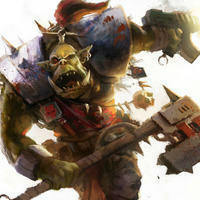 You could design your own monster hunts or create a nemesis for him to track down and defeat or have him defend his territory from greenskins raiders or just about anything. It'd be a great way to introduce him to both basic game mechanics and the role-playing/story-telling elements of tabletop gaming. You get to keep a fighter's equipment if you take a fighter to the doc and the fighter dies because of complications or because the gang can't (or won't ) pay for the service. That sentence on P.116 does appear to create a conflict. Sometimes I wonder if there is a sociopath who works in GW's editing department who intentionally inserts contradictions and ambiguities into the rulebooks in order to frustrate players. P.11 of Gangs of the Underhive states, three times, that fighters can change their "Wargear", but it doesn't say the same for weapons. P.11 also cites P.95 of the Necromunda Rulebook, where it states that: "Players are reminded that no fighter can discard a weapon once added to their Fighter card as described in the Gangs of the Underhive book." The Master-Crafted Weapon rules on P.138 Gangs of the Underhive state that when a fighter replaces a weapon with a master crafted version and the original weapon may be discarded and added to the gang's stash. The next sentence reads: "This is an exception to the norm." P.93 of the Necromunda Rulebook states that you may recover the equipment (except for armor) of your dead gangers so long as one of your fighters was on the battlefield at the end of the end of the battle. The quote you cited on P.116 makes sense when read together with the master crafted rule and the dead fighter rule. However, because the sentence in question is a general statement and doesn't mention or suggest that there are only a couple of instances in which a fighter can discard weapons, the sentence certainly creates confusion. While you may change a fighter's wargear (remember, grenades count as war gear), once you give a model a weapon, as a general rule, you may not voluntarily take it away. The only exception that I am aware of is if you replace it with master-crafted weapon of the same type. For Leaders and Champions this isn't a big deal, because they can have multiple fighter cards. This doesn't let them get rid of weapons, but they can buy as many weapons as the gang can afford, and every game your Leaders and Champions can select up to 3 slots worth of weapons from each model's personal armory. For Gangers and Juves, it's different. They can have only one fighter card, so they are always armed with all of the weapons they own, and once you've filled up their 3 weapons slots, you can't give them additional weapons. This may or may not change how you've chosen to arm your Orlock Gangers and Juves, but If your plan is for your Champions to eventually sell their 130 credit heavy stubbers in order to pay for a different heavy weapon, you can't do it. Unless you replace those heavy stubbers with master-crafted heavy stubbers, those credits are permanently spent and assigned to those Champions. If you are looking for a good Basic Weapon for a Champion, consider the bolter. It's hard to reload (so purchase a backup weapon), but their stats are really good. Be thankful for that. Last night I accidentally stabbed myself in the chest with a hobby knife. I have no f'ing clue how I did it. I was at home, in my office, working on magnetizing my Cawdor when I fumbled my knife (must have rolled a '1'). I juggled the fallen knife for a second or two and the next thing I knew the xacto blade had gone through my hoodie, my t-shirt, and into my chest. It stopped when it hit a rib. Thank goodness it didn't stick into it the bone. I yanked it out and pulled up my shirt before it started to bleed. The wound was quarter-inch long horizontal cut an inch to the left of my sternum. I'm glad I didn't stick myself any further to the left because then it would have gone through a lot more muscle. It bled quite a bit at first, but I applied direct pressure to it and it slowed enough for me to put a Mickey Mouse band aid on it and get back to work on my Cawdor. Good times.